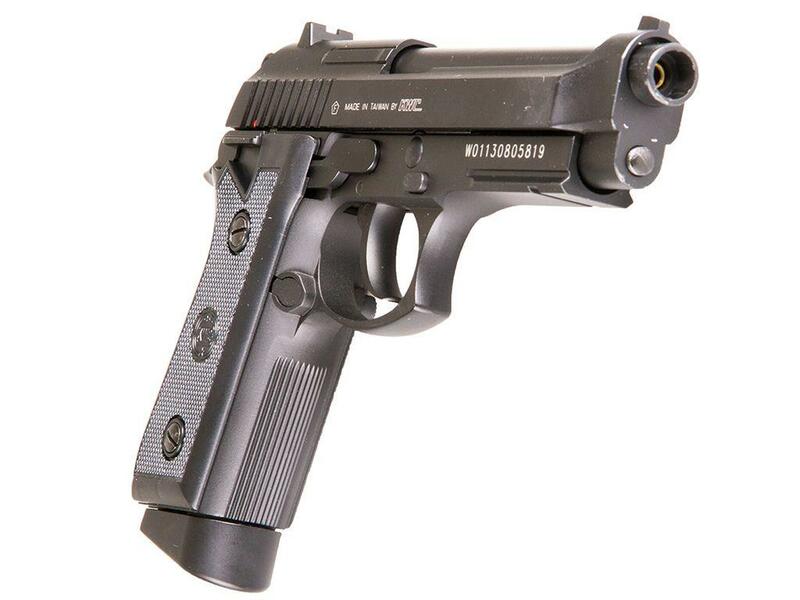 Buy Cheap KWC M92 4.5mm BB Pistol CO2 Blowback | ReplicaAirguns.ca | Easter Weekend Sale! Trigger Pull: The trigger pull is what you would expect from a real automatic pistol, in single action mode it is very light and short. Accuracy: Very good, I was surprised! Build Quality: Excellent, with almost all metal construction, good weight and craftsmanship. 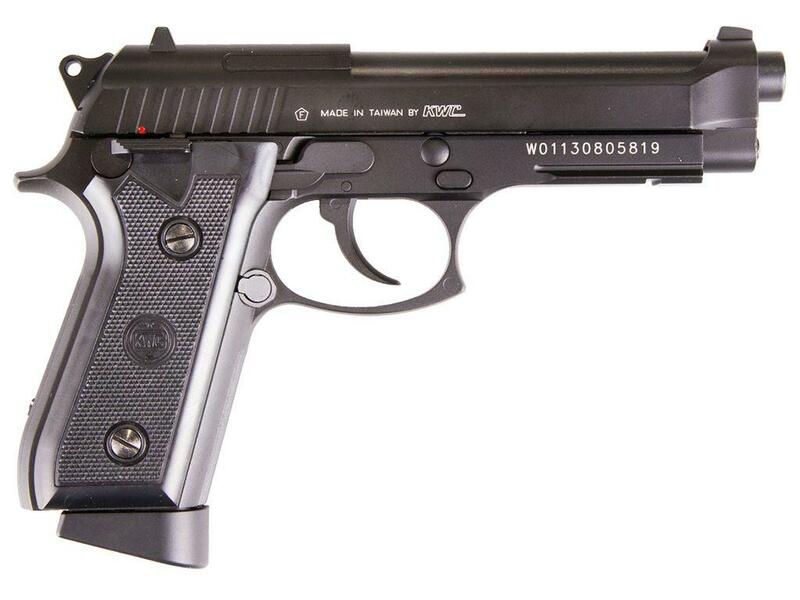 Realism: This is as close as you can come to the look, weight, feel, and action of a 92FS styled gun. 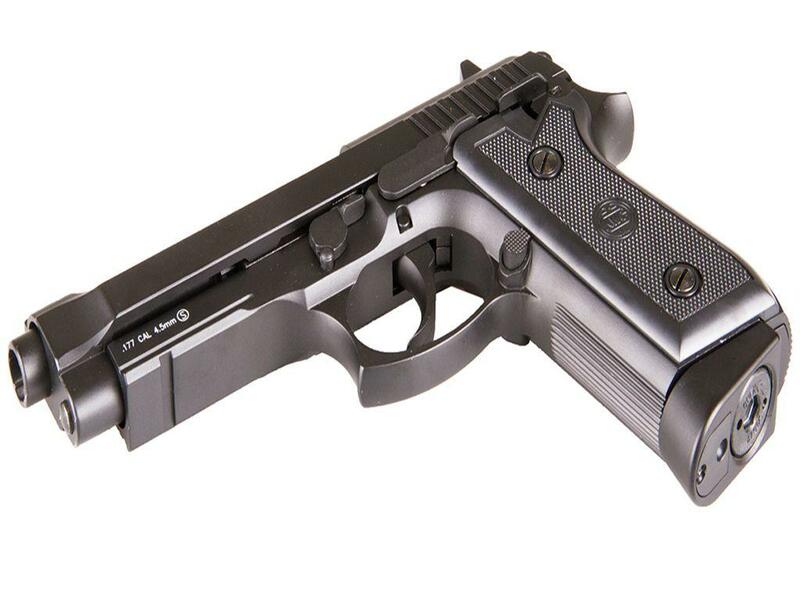 Comments: This BB air pistol is styled after many modern blowback airsoft pistols and functions very similarly to the real steel. It is a very hefty gun made almost entirely from metal and has a very snappy blowback action which adds to its shooting realism. 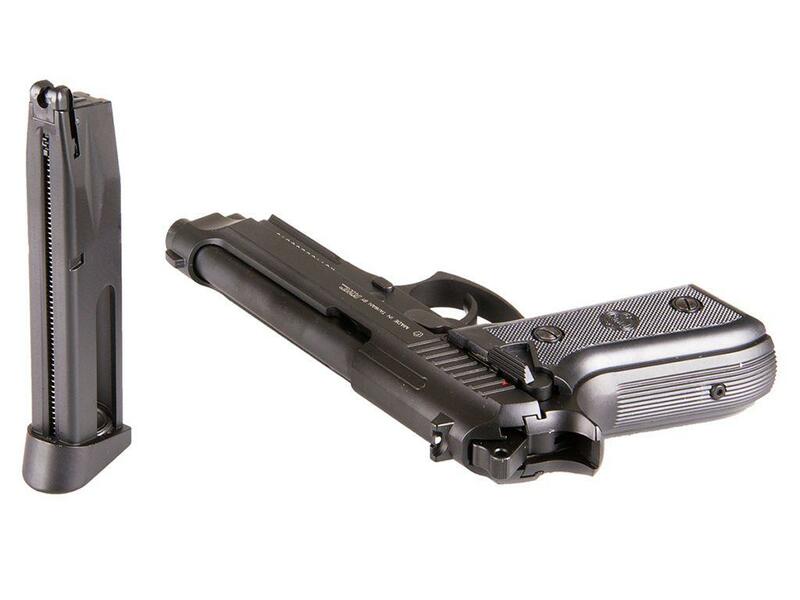 Even the magazine looks and feels like a real 9mm magazine with similar weight and dimensions. 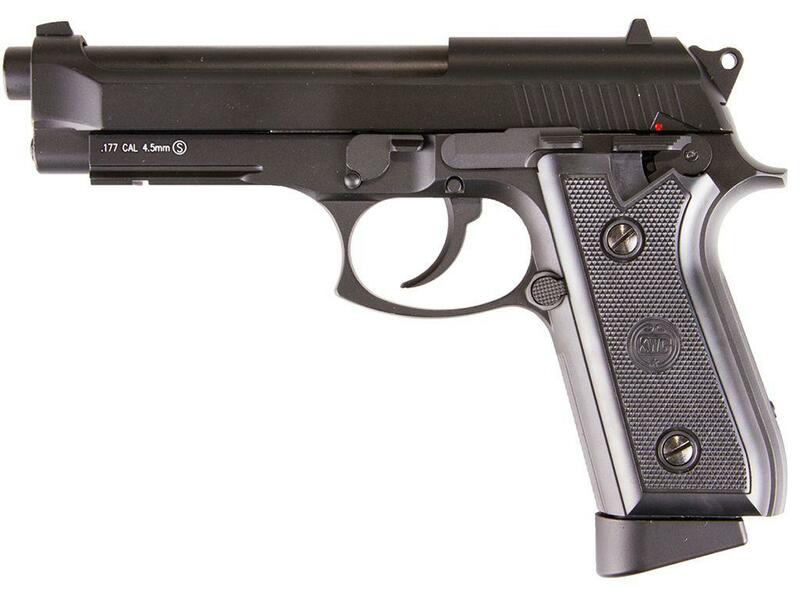 The KWC M92 shoots very accurately for a BB airgun and has fairly decent power considering its blowback function, which does result in heavy usage of CO2. I was able to get about 3 magazines out of a CO2 cartridge when in semi-auto mode. When I shot in full-auto mode I was lucky to get 2 magazines out of a CO2 cartridge. This is a must have replica airgun for many reasons; price, realism, all metal design, performance and also the fact that it's easily moded to select fire in full-auto. I’ve owed lots of guns, and this BB pistol goes way beyond just looking like a baretta. Fully functional blow back action like the real deal. Strips just like baretta, barrel comes out, etc. Mag clips are just like real glock or Baretta double mags. Not my first pick for a rat gun at 320 fps, but still worth it just for its cool factor. Very nice bb gun! Very good quality, very impressive blowback and quite good accuracy. The inconvenients? It consumes a lot and the fps is not super high. My chronograph read speeds ranging from 300 to 334 maximun. But I guess it's just normal since it's a full blowback. It will also ask for a little more maintenance for this reason but it disassembly like a real beretta. The price may seem very high for some but I can guarantee you that it is worth it because it looks and feel a lot like a real because of it weight and it full blowback action! of more it has the full auto mode. I recommand it! http://www.ReplicaAirguns.com - Cybergun GSG 92 CO2 BB Gun Review. This video is a walkthrough Review of the Cybergun GSG 92 CO2 BB Gun. I show off the gun close up and do a field strip, I also take you through many of the features. One thing I forgot to mention in this video is that the BBs load in the magazine with the CO2 almost exactly like they do in the Cybergun Sig Sauer X-Five. So watch my other video on the Sig to see how to load BBs. 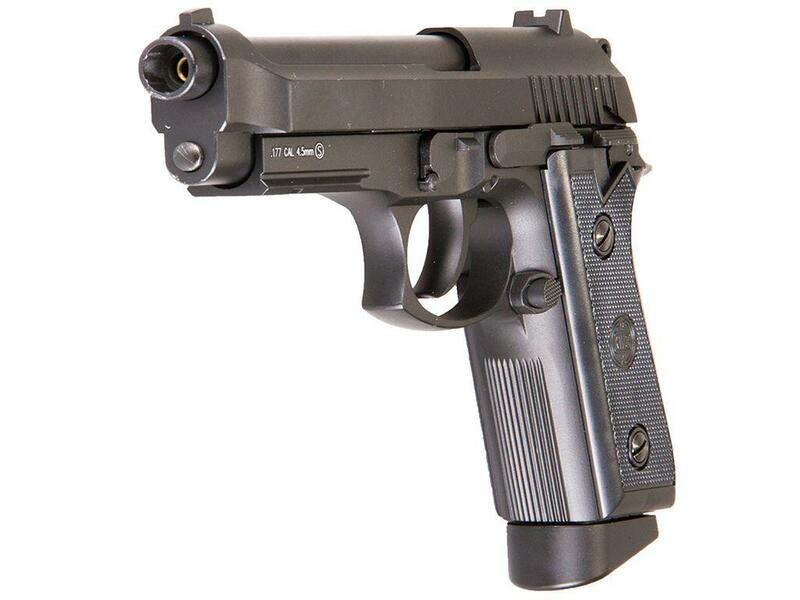 This is a very realistic and fun gun to shoot, it would make a great training pistol as just about everything about it works like the real steel! This one is a bit of a revisit since I already did Full Auto Fun Videos for both my Cybergun GSG 92 and Cybergun Mini UZI, both of which I had to do the conversion mods (GSG 92 Full auto Mod Video - Mini UZI Full Auto Mod Video) to allow them to shoot in full auto modes. The good news is that out of the box the KWC Mini UZI and KWC M92 both shoot in selectable semi auto and full auto modes. And if you didn't already know, the KWC versions are virtually the same guns since KWC makes them for Cybergun. The only real difference being the KWC version does not have the licensing or white lettering on the BB guns and of course the KWC versions are full auto ready to go. So with that said, enjoy my YouTube Full Auto Fun Video of the KWC Mini UZI and KWC M92 Full Auto ready 4.5mm Steel BB CO2 Blowback Replicas.